May is known by many as a competitive month. In this time of the year, many prizes are distributed. Hockey teams are competing for the national title in the playoffs, millions of people watch a man in a pink jersey ride his bike up a mountain and football teams battle for the FA cup and the Champions League title. But these weren’t the largest events of the month of May. While some students will claim the Royal Wedding was the highlight of the month, any true econometrician will tell you The Experience was a lot more exciting. The Experience offered Master’s and third-year students the perfect opportunity to take a look behind the scenes and thus get a better view of the many possible career paths their studies offer. This makes The Experience sound like a standard career event, but the power of this event is in the fact that students are able to visit 4 companies in-house and get a good feeling of the atmosphere and the competitive element added to the company visits. During each inhouse event, students can receive points, both in groups and individually, meaning one person will be crowned winner of The Experience. Even though the formula proves its power each year, several changes were made to the format this year. Students no longer had to sign up for the entire event, but were able to sign up for each company separately. This meant the participating companies could select and host students that were purely interested in the specific company and not just in the event overall. Enough about the organisational changes though, we have to discuss the event. The first arena where twenty chosen VSAE members could lock horns was located right next to the Johan Cruyff Arena, namely ING’s Headquarters which are located in Bijlmer. After a warm welcome and a short introductions, all students got a chance to have a caffeine shot to prepare for the case. The preconception that students are unable to perform early in the morning was confirmed slightly by the average caffeine ingestion. After this short pitstop, everyone was locked and loaded for the morning. The committee got a bit overconfident, making the chairman bluff that some morning gymnastics would be beneficial. As always, this bluff backfired, meaning I had to motivate everyone to get moving. Of course we couldn’t disappoint our largest bank, so I had to lead the morning gymnastics for 19 students and 5 ING employees. This set the tone for a casual morning, disproving the image of banks being boring and stuck in their ways. Now that everyone was sharp, we could start the first case. Every team got the task to manage a bank. We started off by deciding on the marketing strategy and the assets and liabilities invested in. After that, every team had to lead their bank through three economic periods. The booming economy during the first round lead to some very high profits. After trying to decrease risk, the following crisis still hit each group rather hard. Everyone had to beg the European Central Bank for loans. Since the ECB did not have enough funds to save each bank, the groups had to bid for the money, causing two of the five banks to go bankrupt. The first case already had some people take a soaring start in the general classification. The case left enough to discuss while enjoying the kroketten during lunch. After this energising morning programme, a large group left to go to EY, where several new challengers were waiting to join the skirmish. As was the case at ING, EY had prepared everything perfectly. As was the case in the morning, every student was familiar with the company they were visiting. The exact work they would perform for EY was a bit less clear from the start, since econometricians aren’t typically tax advisors or accountants. However, everyone discovered the many possibilities offered by the EY risk branch soon enough. Anything ranging from robotics to actuarial science was possible at this department. After answering all our questions, EY put us to work. Laptops and corresponding spreadsheets were opened. After having our actuarial knowledge tested, we were given the task to interpret the results and present our conclusions. While results were mostly the same, each team interpreted it in their own way, demonstrating the importance of intrepreting and presenting numbers in consultancy. After winning both cases, it was clear that Joost was leading the GC. EY invited us all to a nice thursday afternoon borrel, where we could ask our last questions while enjoying a cold beer and a hot bitterbal. As many VSAE members will confirm, this situation is the natural habitat for most of us, meaning we could close an enjoyable first day in the perfect way. Two weeks later, on the 17th, the second day of The Experience started. This time we had the pleasure to start our day at MIcompany. Naturally, the day started with a short introduction on MIcompany, the most interesting part definitely being MIcompany’s vision on the future of Big Data. While one might expect a Data Analytics firm to claim big data will be the major commodity in 2030, this wasn’t the case. The buzzwords we expected remained unused and the analysts very matter-of-factly explained their belief that different companies will have to use data differently. As an example, the Concertgebouw could use data analytics to maximise ticket sales, but should mainly be focused on hosting impressive artists. After this short introduction, we got the chance to enjoy the sun on the balcony before getting back to work. An inhouse event at a data consultancy firm wouldn’t be complete without performing some data analysis ourselves. It was our task to analyse the booking data of a travel agency and give them our advice on call center staffing. 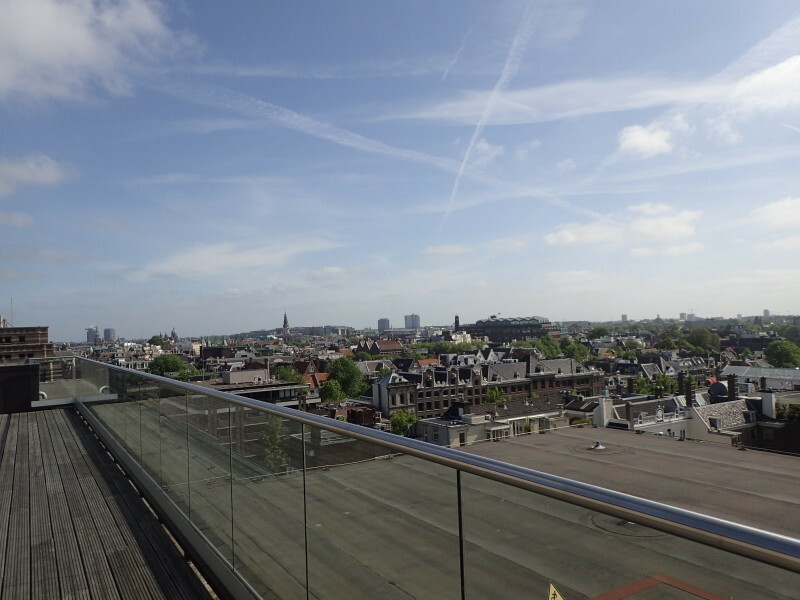 After analysing all data, we could brainstorm on how to present our findings while enjoying a tasty lunch and possibly the best view of Amsterdam’s city center. As anyone can tell you, these inspiring circumstances brought out the best in all participants. 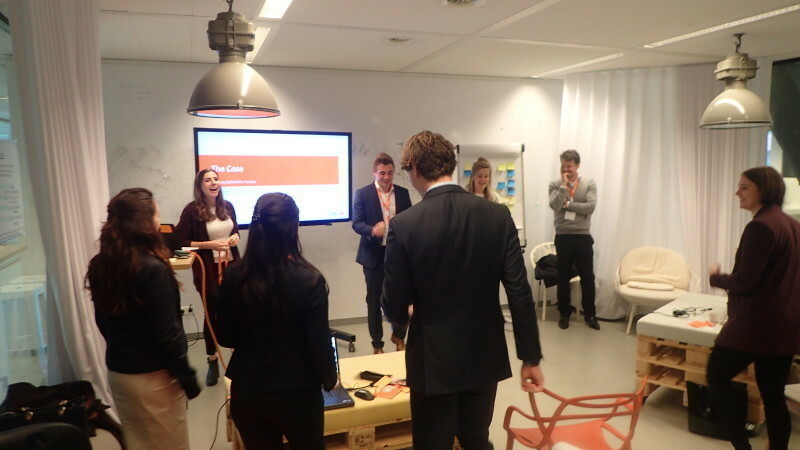 Despite the hard work put into the case by every group, Joost’s team won once again, although this might have been mostly due to the help of Ellen, Stefan and Laura. After the interesting morning at MIcompany we were already on our way to the last company and if there was one thing we knew, it was that Optiver would offer a fitting end to this event. Visiting a trading firm will always be a special experience. Some people might say it is less spectacular now that traders are staring at screens instead of screaming and running around a trading floor, it’s still an impressive sight. Most of us hadn’t been to any trading firms before, which made the visit to the trading floor feel like your first visit to an Ajax match. Despite the introduction on trading, the many screens and telephones used by the traders, we all felt a small adrenaline rush when we witnessed it live in action. It all went a lot quicker than the market making game we had played before and looked more hectic than the arithmetic test we had made before, but we were promised it’s something traders get used to. In each case, we had enough to discuss, which we surely did. Optiver had arranged delicious pizzas and there was enough beer on draught, so we were treated as well as we had been at the companies visited before. What was different was the distribution of points during this afternoon. For the first time, Joost didn’t get any points. Josha had the highest score in the test, although Philip and Sebastiaan were following close behind. The result didn’t change the ranking, since Joost Bos kept his first place and was therefore crowned the official winner of The Experience 2018. 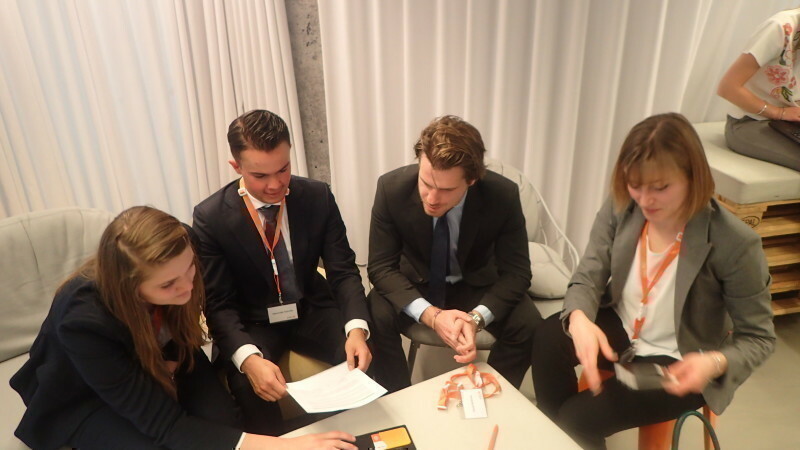 In general, The Experience was a great success, thanks to ING, EY, MIcompany and Optiver offering us the best possible view of the career opportunities they offered. I believe I can speak for every participant when I recommend all students to sign up for the next edition in 2019!